Preheat oven to o 450°. In a stand mixer, combine all dry ingredients (as shown in photo 1). Using a cheese grater on large or coarse size, grate butter into flours (as shown in photo 2) and mix until crumbly. Add the buttermilk, sour cream and vinegar (as shown in photo 3). Only mix it until it pulls together. Over mixing will yield hard biscuits. The mixture will be slightly wet. Let it rest for 20-25 minutes (as shown in photo 4). 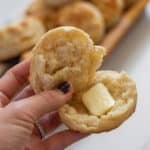 Shape the dough with your hands (for REALLY fluffy biscuits, do NOT roll the dough out) on parchment or a non-stick baking sheet, to 1”-1 1/2″ thick and cut into rounds with a biscuit cutter. Gather remaining dough and use your hands to create another disc. Cut more biscuits out. Bake on a parchment or silicone mat covered cookie sheet for 13-15 minutes or until lightly browned. While I haven’t tried them dairy-free myself, I believe you could do it by using full-fat coconut milk with 1 T lemon juice in place of the buttermilk. You would also then need to use a dairy-free sour cream and Earth Balance butter sticks. Be sure to still freeze the sticks and grate it into the biscuits for the same buttery effect. It is KEY that you not over work them. Only shape them out once then cut your biscuits with a biscuit cutter. Put the extra dough aside and proceed to roll out more from the original batch. When you’ve done that and have a collection of “seconds”, or the dough that has already been rolled out once, use it to roll out one more disc to cut biscuits from. The reason for this is because we don’t want to much air getting into these and taking away from that ultra fluffy biscuit result. Pro Tip: To get a more golden topped biscuit, simply spread butter on top the last three minutes of baking. This will get them more golden. NOTE: Try to work the dough as little as possible both in your mixer and when cutting. Roll it out once and cut then put “scrap” dough to the side. When ready, combine all scrap dough and roll out to make more biscuits. Basically, you want to treat them like little angels or they will not be fluffy and super duper soft. Once you make the dough and cut it into discs, place them on a silicone lined baking sheet and flash freeze for 30 minutes. Remove them from the freezer and place them in freezer ziploc bags. They will keep in the freezer for 1 month or in the deep freeze for 3 months. When you are ready to enjoy them, simply remove, unthaw and bake as directed. Or you can bake from frozen just add an additional 3 minutes to the cook time.